Ryan Hutmacher on the job at Centered Chef. UPDATE: A week after this story was published, Illinois State alum Ryan Hutmacher won The Chew Search for the Weight Watchers Chef competition. Congrats to Ryan! 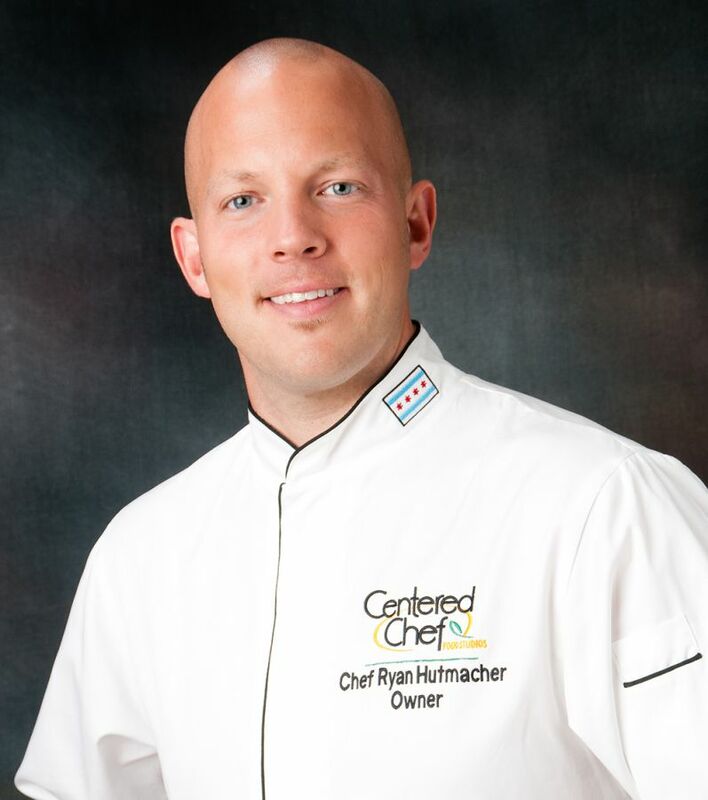 Ryan Hutmacher’s culinary school never trained him to cook in front of a live studio audience, or how to field questions from a TV host while stirring, or how to ace a press interview. But as a finalist this month on a national daytime TV show’s cooking competition, Hutmacher is a natural. The 2001 alum says it’s his Illinois State degree in public relations that taught him how to understand his audience and strategically communicate with them—even through a camera lens. Hutmacher is one of two finalists on ABC’s The Chew Search for the Weight Watchers Chef, with the final cook-off set for February 19. The winner gets $75,000 and a consulting deal with Weight Watchers. But when he’s not a celebrity TV chef, Hutmacher is busy running his own company, Centered Chef, a culinary studio in Chicago focused on integrating clean eating experiences into social and educational platforms, such as cooking classes and corporate team-building sessions. His niche is creating unique food that celebrates health without tasting healthy—exactly what The Chew’s competition is all about. “The Chew is the perfect platform to be able to showcase this,” Hutmacher said. The Quincy native says his PR training at Illinois State gave him a unique perspective when he started Centered Chef in 2005. Beyond knowing how to better understand and communicate with his potential customers, it’s come in handy during his countless appearances on local and national TV shows and interviews for print publications, including Crain’s Chicago Business. Ryan Hutmacher is a finalist on ABC’s “The Chew” cooking competition. He still gets a little nervous on camera—especially on a big show like The Chew—and he’s never had formal media training. But he’s adapted out of necessity. Hutmacher is persistent, and keeping his young business afloat through the Great Recession required a willingness to build buzz—wherever, whenever. Hutmacher’s path from Illinois State to The Chew took some interesting turns. While on campus, Hutmacher worked two jobs, as a student worker in the Career Center and as a cook in a Bloomington restaurant. Both gave him interesting insights into the working world and his future passion. After graduating, Hutmacher got a job offer from a large event management firm. Two days later, the September 11 terror attacks occurred. His industry was decimated, and his career stalled out. “It’s been a humbling journey,” he said. He worked for a rental car company for three years but wasn’t fulfilled. He wasn’t healthy—physically or mentally—so he embarked on a mission to reinvent himself. Recalling his happy days as a cook in Bloomington, he went to culinary school, and then did an apprenticeship at a restaurant in France. It was there he discovered “clean” food for the first time. He exercised too, and lost a lot of weight. “I was that crazy American guy running through the Rhone valley (in France) all the time,” he joked. Leveraging his own health transformation, he’s been building Centered Chef ever since. What started as a catering and personal-chefs company has become something much bigger. Today, Centered Chef has a two-story, custom-designed venue for weddings and other events. And Hutmacher’s appearances on The Chew have his phones ringing off the hook for corporate workshops and speaking engagements. Hutmacher was one of six original finalists for the Search for the Weight Watchers Chef competition. Eligible culinary professionals were invited to enter the contest online by sharing their culinary resume and a short video describing how great tasting food can support a healthy lifestyle and demonstrate how to make an indulgent dish healthier. Hutmacher will be on campus April 8 to speak at Womens’ Health Night at the Bone Student Center, hosted by the Illinois Heart and Lung Foundation. Connect with Hutmacher on Twitter or Facebook.